‘Look now toward heaven, and count the stars if you are able to number them’, God had promised Abram many years before, ‘so shall your descendants be’ (Gen. 15:5). And Abram had looked to the heavens and believed Him. At that moment of faith a vision was planted within the childless Abram, a vision of descendants whose numbers he could not count. ‘You shall be the father of many nations’ he had heard God say on another occasion when His name was changed from Abram to “Abraham, Father of a Multitude”. ‘I will make you exceedingly fruitful; and I will make nations of you, and kings shall come from you’ (Gen. 17:6). And again Abraham believed. What kind of God was this who promised a man such things? But promise begets vision. The God- given vision planted in Abram’s spirit took root, becoming embedded, becoming inseparable from him. He would be a father; his posterity would fill the earth and reign over peoples. God had promised, Abram believed, and so he took the natural steps to ensure God’s promise would prevail. With Sarai his wife unable to conceive, Abram did what any other man in his time and culture would do: he implanted his seed in Sarai’s maid Hagah and waited for God to do the rest. A son, Ishmael was born, and Abram rejoiced that the first part of God’s promise had been fulfilled. The vision received on that starry night many years before was well on its way. Then God said to Abraham, ‘As for Sarai your wife, you shall not call her name Sarai, but Sarah shall be her name. And I will bless her and also give you a son by her; then I will bless her, and she shall be a mother of nations; kings of peoples shall be from her.’ Then Abraham fell on his face and laughed, and said in his heart, ‘Shall a child be born to a man who is one hundred years old? And shall Sarah, who is ninety years old, bear a child?’ Then God said: ‘No, Sarah your wife shall bear you a son, and you shall call his name Isaac; I will establish My covenant with him for an everlasting covenant, and with his descendants after him’ (Gen. 17:15-17). At that precise moment Abraham found himself suddenly confronted with a reality each of us will face sooner or later. God did not desire Abraham’s assistance to fulfil the vision He Himself had planted. Rather shockingly, God would actually prefer it if Abraham hadn’t interfered at all. Ishmael is not the evidence of Abraham’s faith. Ishmael is the evidence of Abraham’s independence. The answer, as we know, was ‘no’. Ishmael is a child of the flesh, Isaac will be a child of the Spirit. And Spirit and flesh can never mix (John 3:6). Everyone who has ever conceived a vision from God must be brought to this moment of truth. No matter how ‘worthy’ the vision that drives us, be it related to ministry, family, church planting, a life of worship and service, healing the sick, or any number of other possibilities, our efforts to walk in it through our own willpower will only serve to complicate and delay its fulfilment. God-given vision is intrinsic to our spiritual growth. It exercises and strengthens our faith and assists us in learning who we are in Christ. But vision must not define us. If we are finding our identity in anything other than Christ, even in a God-given vision, we have not yet done with the flesh. There are going to be times in our journey when God calls us to lay on the altar the very vision He has planted into us. For those who have never experienced being broken by God, such a suggestion will not make sense. We may spend weeks, months or years anguishing over where we went wrong. Did we not hear God properly? Did we disobey Him? Has He forsaken us? At such times we will entertain any possibility other than the one we do not want to deal with: that God simply asks us to lay down our vision, let go, and trust Him with the outcome. Often the vision we carry has not come about simply because we have yet to learn the most basic lesson: all God-given vision is an expression of Christ. Christ is life and every spiritual vision truly given by God is but a tiny seed of that Christ-Life. Furthermore, we are not the originators of the vision, God is. He plants, we carry. When our God-given vision becomes mixed with the strength of our flesh, when our focus becomes centred on how we can bring the vision about, God must deal with us. If it is to survive, our vision must be purified and our focus must be brought back to Christ. Then He said, ‘Take now your son, your only son Isaac, whom you love, and go to the land of Moriah, and offer him there as a burnt offering on one of the mountains of which I shall tell you’ (Gen. 22:2). 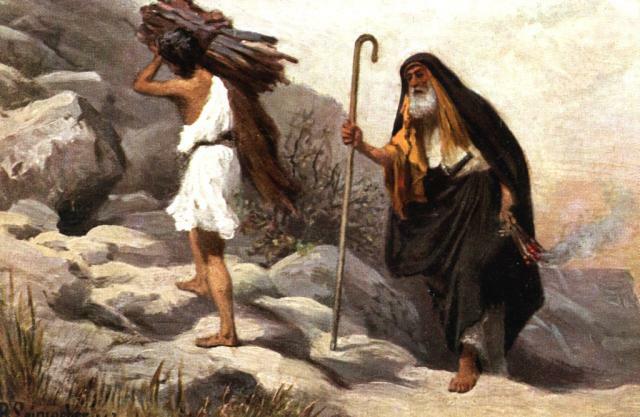 There was no distressed pleading from Abraham at Moriah. ‘Oh that Isaac might live before You!’ was not heard echoing down the mountainsides. The hand that held the knife ready to slay his son was the hand of a man dying to his own strength, will and understanding, yet alive to God through faith. Abraham no longer had a plan B. Ishmael, the son of the flesh, now banished, would not be his backstop. The vision of descendants numbering more than the sand of the sea was entirely dependent on Isaac, son of the Spirit, living and reproducing. Abraham’s readiness to relinquish Isaac into God’s hands was not fatalism, but faith, for he believed God could and would raise his son even from death (Heb. 11:19). And He said, ‘Do not lay your hand on the lad, or do anything to him; for now I know that you fear God, since you have not withheld your son, your only son, from Me’ (Gen. 22:12). You have not withheld your only son! On Mount Moriah God speaks of Isaac as the ‘only son’ (Gen. 22:2, 12). And so it was. For Abraham, the flesh had been crucified, the God-given vision would come to pass: born of the Spirit, sustained by the Spirit, and fulfilled through the Spirit, without the touch of man’s flesh. All God-given vision is an expression of Christ. When we begin to understand this truth, God can trust us as vision bearers. Reblogged this on The Voice of One. “The hand that held the knife ready to slay his son was the hand of a man dying to his own strength, will and understanding, yet alive to God through faith.” This hit me right between the eyes! Amen. Also, that we need to identify in Christ, even moreso than a God-given vision or ministry. May I reblog this? Thankyou Teague. You are most welcome to reblog. Bless you! Beautifully put. Thank you for reminding us that everything begins with Him and it is carried through by Him in order to glorify Him. Often I forget that and get impatient with what I believe God has called me to do and in my flesh try to push things. Thankyou for your comments Lydia. God bless you! Thank you Cheryl. I always think of Isaac as the first living sacrifice – one who has died yet is alive. And you are so right – every promise from God must go through the same process in order to manifest Christ. Thanks Tobie. Yes, I agree with your definition of a living sacrifice. Brilliant! In a day when so much is spoken about ‘vision’ in the name of the Church, and yet so little understanding of true vision prevails, your contribution comes as a cooling breeze. I especially appreciated your point that true vision cannot exist or find expression apart from Christ, his person and purpose. Thanks for putting it into words, so succinctly, accurately and beautifully. If only I’d learned this a bit earlier in life 🙂 Bless you for your encouragement Erroll!